I was recently introduced to the website Project Gutenberg (www.projectgutenburg.org) which rather impressively holds the title for being the oldest digital library.Started by a gentleman called Michael Hart back in 1971, the website is a volunteer effort which is designed to archive and distribute cultural works which have fallen in to the public domain. The venture began when Michael was given an account with $100,000,000 worth of computer time by the operators of a mainframe at the medical research lab at the University of Illinois.This gift was a chance occurrence which can be attributed to his good friendship with two of the four men operating the machine, along with being simply in the right place at the right time. Unsure what to do with this free time, he announced that the best way he could use this gift would be to begin archiving material stored in hard copy and distributing so that anyone could have easy access to it.He then proceeded to type up the Declaration of Independence with the intention of eventually having 10,000 of the most consulted books available to the public by the end of the 20th century. To this day, the website currently has over 24,000 items in its collection; most commonly these works are books which have lapsed their copyright period.Since the website is based in the US, it follows the US copyright law which states that any piece of copyrighted work which was published before 1923 immediately falls in to the public domain.There are instances in which books published in later years didn’t clearly define their copyright or renew it and these are also now available freely and legally in the public domain.In addition, several copyright owners have actually given permission for their work to be replicated and distributed free of charge on the website, despite still being within copyright. Essentially the website gives you immediate access to a huge collection of cultural works completely free of charge.Let’s say for argument sake that you fancy reading Hamlet over the coming week; since this book was written around 1599 it is quite clearly out of copyright and as such it is completely free of charge to download and distribute.By heading to the Project Gutenberg website you can do a quick search for William Shakespeare and practically all of his work will instantly become available to you. When downloading you do have a choice of formats that you can use, these include a simple text file or something more complicated such as an Adobe Acrobat file which will contain features such as indentation, page numbering, headings and other such formatting hence making it far more suitable for printing.You can even download a file that can be used on a Pocket PC or mobile phone and whilst I can’t think of anything less enjoyable than reading Hamlet on my mobile, it would be possible on a PowerPC making the option handy if you’re often on the move. Because novels are made up of simple text they are surprisingly quick to download; as an example, I tried downloading “The Time Machine” by H. G.. Wells and it took me just 12 seconds on a broadband connection.Of course the speed of download is fairly irrespective when you take in to account the time required to read it but I find it interesting that an entire book is actually smaller to download that a high resolution image. 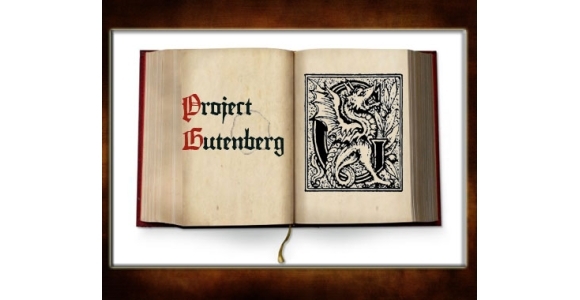 Project Gutenberg is exciting to me as it represents the fact that we have now reached a stage of development whereby no matter how much time passes, the great works of both today and yesterday will never be lost.As a society, we now enjoy a greater access to free, uncensored and good quality material, and long should this remain.